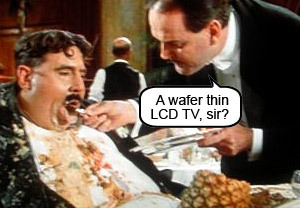 LG has slammed the gauntlet down to other TV manufacturers by announcing the world’s thinnest LCD screens. Their new 42 and 46 inch models measure up at an outrageously slender 5.9mm thick (0.23 inches) – a truly remarkably feat of engineering that makes our current LCD screen match the proportions of Fatty Arbuckle and Billy Bunter’s undies. Combined. April has proved to be another gloomy month for the cats at Apple as retail sales continue a downward arc, according to figures from the NPD Group. Analyst whizz Gene Munster from Piper Jaffray cast his beady eyes over the sales data and noted that Mac sales were down 1.8 percent compared to a year ago. 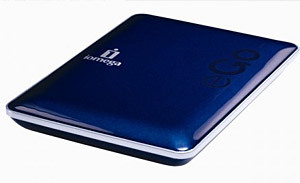 Looking sleeker than an oily torpedo sliding through an ocean of hot butter is the new Iomega Announces eGo portable hard drives, announced Sunday. 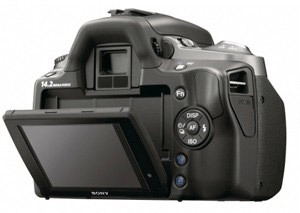 Sony has released details of its new range of budget Alpha digital SLR cameras, with the company targeting folks looking to upgrade from compact cameras into the big wide world of dSLR shooting. 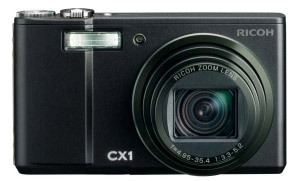 Surrounded by the hastily expelled contents of the cardboard box it came in is Ricoh’s brand spanking new CX1 digital compact camera, which has just arrived at Digi-Towers for review. 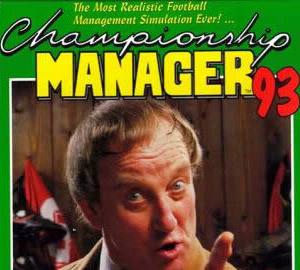 Championship Manager, one of the most hideously addictive games ever created by humans has been released for the iPhone. Simultaneously wonderfully playable and hideously anti-social, we had to force ourselves to give up playing the game way back when it was an Amiga title. Call us cynical old rascals if you will, but we can’t help suspecting that there’s been a few palms greased along the way to make this happen. 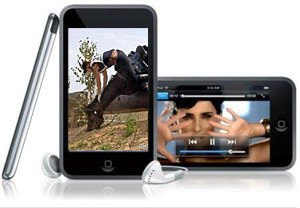 The University of Missouri journalism students are now being ‘required’ to purchase an iPhone or an iTouch for their next college term. Simply begging, nay demanding, that it be introduced with some half-cocked pun like ‘Asus to start shifting super sleek Seashells with a C Drive’, we can announce that their quirkily named netbook will indeed be shimmying their way on to UK shop shelves this month. 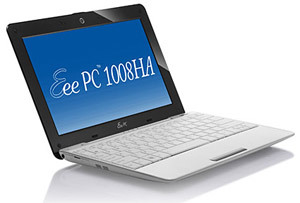 The 1008HA Eee PC is one smooth looking slab of soapy-smooth loveliness, looking a mere slither of a thing at just one-inch thick. 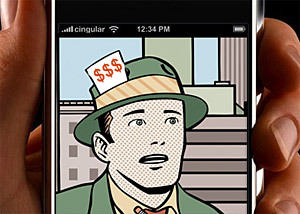 Amazon To Launch Newspaper Reader? 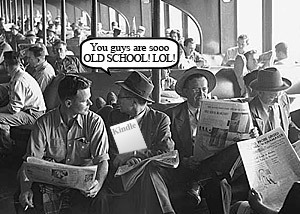 Speculation-o-meters are being cranked up to max on the web, as rumours of a new Kindle book reader for newspapers continue to circulate. Amazon have invited members of the press to an event tomorrow which the The New York Times has suggested is to mark the launch of a Kindle-like reader sporting a much bigger screen. Continue reading Amazon To Launch Newspaper Reader? 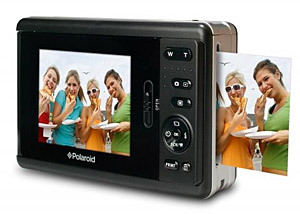 Despite being one of the best-known names in photography, Polaroid have twice been declared bankrupt in recent years, but like Dracula on Red Bull, they’re jumped up from the grave one more time to try and make a killing.